I've been quiet up until now about Kickstarter, but I am quite a fan like most of us. It has really allowed for some great projects to take off, and is a good model for determining market viability prior to investment - something I appreciate financially. Previously, I've supported the popular OGRE from Steve Jackson Games, which surprised just about everyone involved by raising almost a million dollars. 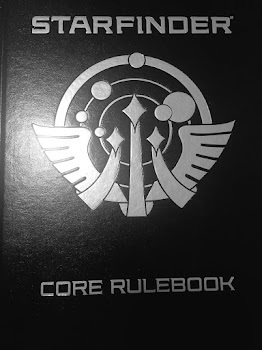 As a huge fan of tabletop games - not just RPGs, but all board, card, and dice games - I was ecstatic to see that a market still exists for this form of media. 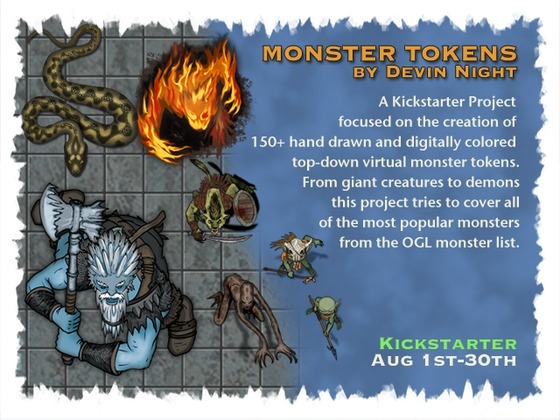 Most recently, Cobalt Kobold has decided to support Devin Night's Monster Token project. He's going to create a ton of monster illustrations, and hey - as it turns out, I have a variety of game ideas that need monster illustrations! I also run game sessions online with MapTool, so these will no doubt come in handy there. Devin Night has a great history of illustrations with the token format, many of which he gives away for free, and I have no doubts that this set will be of excellent quality. So, whether you play online or just want some nice monster art, go check out his Kickstarter and support it at a level you feel comfortable with. We as game folks have to support the artists that accessorize our imaginations!